It was no secret that District 6-6A is tough in the distance events. But, did we know it was this tough? Both the girls and boys distance events not only showed that it was top heavy with elite runners, but it also displayed the depth and quality of the teams and athletes. 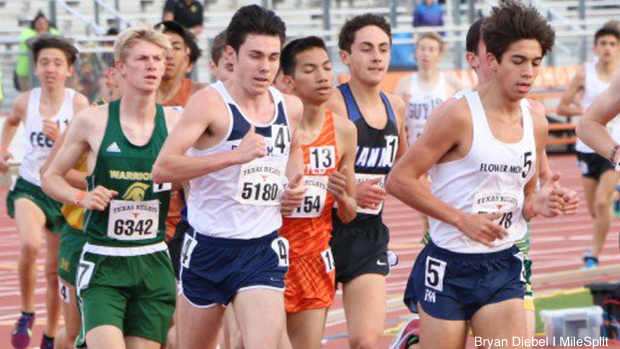 With some of the top distance programs state wide, advancement to the area meet was bound to be survival of the fittest type of races from the 800m and up. A 2:20 800m in this district meant you season was over. It took 2:15.91 to take the win as Anastaysia Davis did. She was followed by Morgan Colon (2:18.40) and Rowan Hassman (2:19.02) from Coppell. Flower Mound freshman Abigail Black 2:19.43 showed she was up for the challenge as she qualified to move on. The top five finishers all ran sub 5:10. Flower Mound runners flexed their muscles as freshman Natalie Cook (5:00.08) led the way, followed by Davis (5:03.22), and Allie Lyda (5:03.53). Coppell's Chloe Hassman (5:03.53) placed third overall to punch her ticket to the area meet. The girls 3200m was the strongest of the district races. It is the only district in the state to have four girls all run under 11:00. Freshman, Cook of Flower Mound (10:30.41) and freshman Austin Owen (10:52.65) of Marcus went 1-2 leading the rest of the field. Hebron senior Aaliya Fazel (10:54.79) and Lyda of Flower Mound (10:56.39) will also represent the district at the area meet. Although only our girls moved on and only four ran under 11:00, that didn't mean the rest of the race wasn't still blazing. In all, there were 12 girls to break 12:00 and places 5-9 ran 11:20 and under. The boys JV 800m should have been a sign of what we would see in the other events. Irving senior Keyshawn Young had himself a heck of a meet. He first dropped a 400m PR with his 49.20, which is outstanding for a JV 400m, but then added amped things up with an 800m PR. His previous best was a 2:00.20, but he obliterated that with a four second improvement for 1:55.23 and an over 10 second win in the race. The boys varsity 800m saw 10 boys run 2:00 and under. It took 1:55.95 just to be able to make it out of the district to area. Coppell's Jackson Walker has been on fire this season won the district with a TX #2 1:52.13 followed by Marcus senior Harold Murphey in 1:53.47. The JV boys 1600m was another outstanding display of how strong the district is. Yes, there were plenty of 5:20s and low five minute times, but there were also some faster times. There were seven sub 4:40 times that were led by Colin Proctor of Coppell and Johnathan Flint of Flower Mound. Proctor won the race with a 4:28.25 and Flint followed with a 4:28.97. With two 4:28s in the JV ranks, you know the varsity race had to be fast. And that it was, Alex Maier busted a 4:16.31 for the win followed by Marquentin Barnes of Irving MacArthur and a duo of Hebron milers in Jayce Turner and Myles Richter in 4:20.94 and 4:21.24. The JV boys 3200m was just as impressive and fast as the 800m and the 1600m. There were eight runners who ran 10:00 and under. Led by Ricks and Flint who finished second and third in the 1600m, they paced the 3200m as well. The Flower Mound teammates ran to 9:35.06 and 9:37.89 for the top two spots. As with the other distance races, the varsity boys race was another barn burner. Again, Maier led all with his 9:10.87 as there were 11 more guys that ran 10:00 and under totaling 19 total in the district. Maier was followed by Richter (9:12.23) and Turner (9:18.50) of Hebron who also made it out in the 1600m. Flower Mound's Thomas Romanow (9:21.23) and Jarrett Kirk (9:29.77) made five to dip under 9:30. Now that district meets are over, next up on the road to the state meet is the UIL 6A District 5-6 Area meet. That will match up the qualifiers from this district and those from 5-6A.